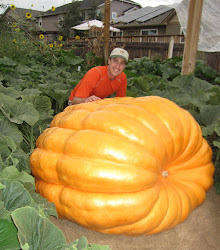 So you've got a big pumpkin growing and you are going into the close of the season. What do you do now? To get your pumpkin to the scale is no small feat. Almost half of the pumpkins I've grown didn't make it to the scale or made it to the scale damaged. There are some things you can do to help increase your changes that you end the season strong. Watch your watering. As the days get shorter and the temps cool off you can probably back off on the water some, which will decrease the risks of fungus and rot. Spray for powdery mildew. This time of year powdery mildew likes to form on the leaves. It is common to get some, but if it gets out of control it can cause big problems. Actinovate or a good fungicide work well to prevent. Don't wait until you see it growing. Check the pumpkin for damage and splits. Often times you can stop rotting in its tracks if you catch it early. A 10% solution of bleach and sulfur powder will often knock it out when it is small. Some foliar sprays of seaweed on the leaves in September is a good idea. It helps protect the leaves and seems to keep them going a little longer. Can also help prevent light frost bite. Check stump and stem for soft spots and oozing. If you find any, keep the area dry and apply a 10% solution of bleach and sulfur powder. Nutrients can start getting depleted in the soil late in the season, so make sure plants are getting what they need. Some growers attribute splits in pumpkins later in the season because of calcium and nitrogen deficiencies. Nobody has proven that as far as I know, but ideal growth comes from just the right amount of nutrients in the soil, so keep the plants fed. Possibly a little more foliar applications wouldn't be a bad idea at the end of the season.